This entry was posted in Midd Blogosphere and tagged conservation, Environment, Federal State and Local Government, Internships, marine research, NOAA, Social Impact on January 29, 2018 by Tracy Himmel Isham. “In Their Own Words” is an ongoing series featuring the experiences of Middlebury students at their summer internships. This summer Luke Elder ‘13 interned with The Nature Conservancy in Martha’s Vineyard, MA. Luke Elder ’13 and Max Hoffman ’14 interned for The Nature Conservancy this summer. I worked as a conservation intern for The Nature Conservancy, specifically doing land stewardship and management. We did invasive species control, native plant nursery work, vegetation monitoring, and were involved with a few studies that the TNC Island Office have been conducting for a few years. I learned a great deal about what it means to have a field job. My previous environmental or conservation work experience has only been composed of office research jobs, but working for TNC in the field truly showed me what is takes day to day to be a field biologist. For anyone interested in biology, botany, ecology, land conservation and management, I would recommend this internship without hesitation. The experience has taught me a lot about botany and plant work, something that I had never really been exposed to before. I realized that I think I have more of a passion for wildlife work (which I got a little exposure to through this internship as well). But regardless, getting the experience to help me navigate through figuring out what I like and what I don’t like has been so helpful. Working for The Nature Conservancy has been a formative experience that has solidified my passion for conservation work. I plan to continue finding work in the field of conservation biology, and after my experience working for TNC I could easily see myself finding a job working for TNC in the future. I had an incredibly positive experience with the organization and have nothing but good things to say about what they do. This entry was posted in Midd Blogosphere and tagged Biology, botany, conservation, conservation biology, Environment, internship, invasive species control, land management, land stewardship, Martha's Vineyard, plants, planty nursery, Summer Internship Series, The Nature Conservancy, vegetation monitoring, wildlife on October 19, 2012 by Hillary Chutter-Ames. 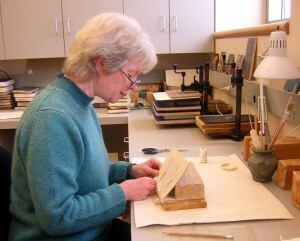 Ginny Faust in the Conservation Workroom. While some of the work of LIS varies with the semesters and seasons, other work continues quietly at a regular pace and sometimes goes unnoticed. Ginny Faust, Binding and Conservation Technician, works to maintain and improve the condition of both the circulating and special collections of the libraries. Routine preservation activities like binding and reinforcement of new materials, repair of worn and damaged items, and repackaging of media materials have gone on for many years and the result of these activities is a library collection in generally excellent condition of which Middlebury can be proud. In recent years we have expanded our work to include the conservation of selected Special Collections materials. Ginny has taken classes and independently studied to improve her conservation skills. We are now able to cost effectively complete conservation treatments in-house that we could not afford to outsource to a professional conservator. To see examples of this important work please see the overview and gallery here. This entry was posted in Midd Blogosphere and tagged Collection Management, conservation, Preservation on March 23, 2010 by Joseph Watson.